b Istanbul University, Faculty of Forestry, Istanbul, Turkey. c Abant Izzet Baysal University, Faculty of Agriculture and Natural Sciences, Bolu, Turkey. d West Virginia University, School of Natural Resources, Morgantown, WV, USA. Recently, oak (Quercus spp.) management strategies in Turkey have transitioned from predominantly coppice-regeneration to seed regeneration. However, impacts of this change on the small mammal community is unknown. To address this issue we evaluated abundance of Apodemus spp. (Rodentia, Muridae) in relation to stand age and forest characteristics in the northern Thrace, Turkey. We sampled 43 plots using box-style live traps. A total of 75 individuals (0.125 ± 0.013 mice/trap nights) was captured. Apodemus flavicollis (n = 69) was the most abundant, although A. agrarius (1) and A. sylvaticus (4) also occurred. Apodemus spp. abundance was superior in older than in younger stands (P = 0.038). The number of specimens was positively related to diameter at breast height (DBH) (y = 0.18 + 0.015x, R2 = 0.21) and forest floor mass (y = 0.005 + 0.00005x, R2 = 0.22). Increasing the amount of forest floor mass and mast production will benefit the population of Apodemus spp. Abandonment of the coppice management on oak forests in Thrace may positively affect the local abundance of Apodemus spp., particularly A. flavicollis. Key words: Apodemus flavicollis, diameter at breast height (DBH), forest floor. Recientemente, las estrategias de manejo de encina (Quercus spp.) en Turquía han pasado de ser predominantemente de regeneración por monte bajo a regeneración por semillas. Sin embargo, los efectos de este cambio en la comunidad de mamíferos pequeños son desconocidos. Para hacer frente a estos problemas se evaluó la abundancia de Apodemus spp. (Rodentia, Muridae) en relación con la edad del rodal y las características de los bosques en el norte de Tracia, Turquía. Fueron muestreadas 43 parcelas utilizando trampas vivas de estilo caja. Se capturaron 75 individuos (0,125 ± 0,013 ratones por trampa y noche). Apodemus flavicollis (n = 69) fue más abundante, pero A. agrarius (1) y A. sylvaticus (4) también se presentaron. La abundancia de Apodemus spp. fue mayor en los rodales más viejos que en los más jóvenes (P = 0,038). El número de individuos se relacionó positivamente con el diámetro a la altura del pecho (DAP) (y = 0,18 + 0.015x, R2 = 0,21) y con la masa de mantillo (y = 0,005 + 0.00005x, R2 = 0,22). El aumento de la cantidad de mantillo y de los fustes beneficiará a la población de Apodemus spp. El abandono del manejo de monte bajo en bosques de encina en Tracia puede afectar positivamente la abundancia local de Apodemus spp., en particular A. flavicollis. Palabras clave: Apodemus flavicollis, diámetro a la altura del pecho (DAP), piso del bosque. Small mammals are generally viewed as pests in agricultural areas around the world (Quin et al. 2000). Nonetheless, in forested areas, small mammals are important as dispersers of mycorrhizal fungi (Terwilliger and Pastor 1999), as prey items for predators (Jedrzejewski and Jedrzejewska 1992), as influential biotic agents on physical and chemical properties of soil and as predators of insects and other small animals (Sieg 1987). The genus Apodemus (Rodentia, Muridae), which is comprised by true mice and rats, is distributed in the Palearctic Region (Krystufek and Vohralik 2007). Apodemus spp. predominates in forested areas. Although a number of studies have occurred on mice in Europe, the relation between habitat characteristics and rodent abundance is still equivocal (Khidas et al. 2002). Information on the Apodemus genus was limited, during the conversion of coppice to high oak forest and the early stages of succession of coppice oak forest in Turkey. Oak (Quercus spp.) is an important genus for Turkish forestry. In the past, most oak forests were managed through coppice cuts via clear-cuttings in 20-year rotations. The intensive use of oak forests under coppice management has caused long-term degradation in oak forest ecosystems. The Turkish General Directorate of Forestry has abandoned coppice forest management during the last decade, and now promotes conversion to high forest originating from seed. The new management regime positively contributes to ecosystem services such as carbon storage (Makineci et al. 2015) and arthropod diversity (Keten et al. 2015). However, impacts on the small mammal community are unknown. In the current study, we hypothesized that Apodemus spp. richness and abundance at coppice-regenerated oak sites increased with stand age and varied by site. The objective is to relate the abundance of Apodemus spp. to stand type and to developing stage stand characteristics in coppice oak forest. Study area and sampling. The study was conducted on pure oak stands in northern Thrace, Turkey (figure 1). Elevation of stands varied from 125 - 680 m above sea level. The common oak species were sessile oak (Quercus petraea (Mattuschka) Liebl. ), Hungarian oak (Q. frainetto Ten.) and Turkey oak (Q. cerris L.). The history of the rotations and the clear-cut schedules was unfortunately unknown for the study sites managed as coppice stands (Keten et al. 2015). Vize and (5) Catalca, Turkey. Vize y (5) Catalca, Turquía. At five sites (Catalca, Demirkoy, Igneada, Kirklareli and Vize), sample plots (100 x 100 m) belonging to three development stages (A, B and C) were sampled. Stands were classified by stages of development; "A" (0 - 8 cm), "B" (9 - 20 cm) and "C" (21 - 36 cm) mean diameter at breast height (DBH) scales, using the categorization values of the Ministry of Forest and Water Affairs of the Republic of Turkey (Keten et al. 2015). We selected a total of 43 plots that represented the five study areas. Sampling was conducted on sample plots from each site, from three stand types, which were replicated three times, except for Catalca where stand-types "A" and "C" were only sampled two times. Plot coordinates and elevation were determined by Global Positioning System (Garmin GPS60). Tree species and tree density were determined by counting trees from a 20 x 20 m subplot located in the center of the 100 x 100 m plot (Keten et al. 2015). We measured DBH and crown diameter of trees. DBH was measured using tree calipers. Crown diameter was measured using the diametric projection of the tree crown on the forest floor by a measuring tape. Soil pH was determined using a pH meter (Hanna model HI221). Forest floor mass, which consisted of shed vegetation parts (litter, decomposing litter and humus layers) and understory mass, which was comprised of herbaceous plants (0 - 80 cm tall vegetation) were also recorded. Five samples were collected for understory and forest floor in each plot. Understory samples were taken by cutting above-ground parts of all herbaceous mass in a 1 m2 area and the samples of the forest floor were taken from 0.25 m2 area by collecting all the forest floor material over mineral soil. In the laboratory, understory and forest floor samples were dried to a constant mass at 70 °C and weighed (Makineci et al. 2011). Apodemus spp. were sampled in July 2009 at each of the 43 plots using a box-style live trap model SH301 produced by Teknikturk Company. Each 100 x 100 m plot was divided into 16 subplots (25 x 25 m) and enumerated for allocation of sampling points (figure 2). 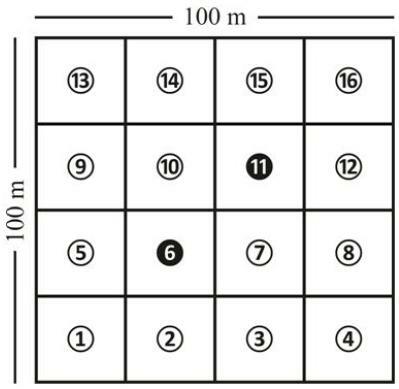 The traps were placed in the center of each subplot, and checked 24 h later, except at numbers 6 and 11 as a different trap type was used for insectivorous species. A total of 602 trap nights were sampled. We used crushed peanuts as bait. Species were identified based on well-known color and morphological differences. indicates sampling subplots, and solid circle indicates non-sampling subplots. blancos: subparcelas de muestreo; círculos negros: subparcelas sin muestreo. Data analyses. We calculated the number of mice captured per trap night and used these values for analyses. Data were transformed by Log (number of specimens + 1) for analyses because they were not normally distributed. The one -way analysis of variance (ANOVA) was used to compare number of Apodemus spp. among sampling sites (Catalca, Demirkoy, Igneada, Kirklareli and Vize) and stand types ("A", "B" and "C"). Mean (x) and standard error (SE) of stand characteristics (tree density, DBH, crown diameter, soil pH, forest floor mass, understory mass, elevation, tree diversity) were determined for each stand type. 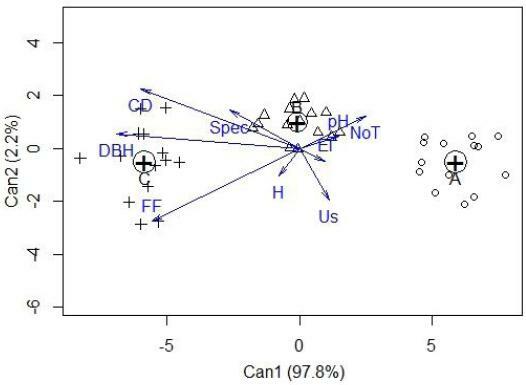 Tree diversity was calculated using the Shannon-Wiener (H') biodiversity index for woody plant species in each plot. Apodemus spp. abundance was examined in relation to habitat characteristics using the simple linear regression analysis. The canonical discriminant analysis (CDA) was used to differentiate stand types based on all stand characteristics measured in the study. 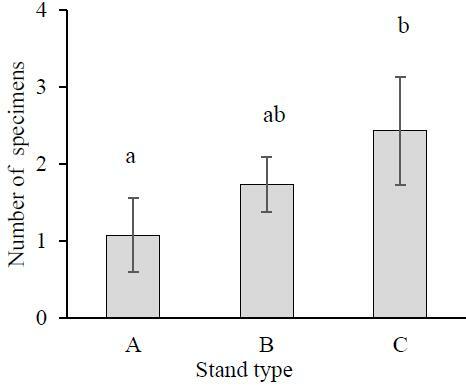 The first axis (Can1) was compared with stand types using ANOVA. Following a significant ANOVA, we used Tukey HSD as a mean separation technique. Significance was set at a = 0.05 level. All tests were conducted using Program R Gui version 3.1.1 (R Development Core Team 2015). We captured 75 individuals of Apodemus spp. (0.125 ± 0.013 mice/trap night), comprised of A. sylvaticus (4), A. flavicollis (69), A. agrarius (1) and unknown (1), from 602 trap nights in 43 plots. The number of specimens was significantly influenced by stand type (F240 = 3.55, P = 0.038) (figure 3), though not by sampling site (F4,38 = 2.37, P = 0.070). Apodemus sylvaticus was only recorded in young stands measuring < 10 cm DBH. ["A" (0-8 cm), "B" (9-20 cm) and "C" (21-36 cm) mean diameter at breast height (DBH)]. [DAP: "A" (0-8 cm), "B" (9-20 cm) y "C" (21-36 cm)]. Based on stand types, DBH, crown diameter, forest floor mass and number of trees per hectare varied, though elevation, soil pH, understory mass and H' did not (table 1). The number of Apodemus specimens was positively influenced by DBH (y = 0.18 + 0.015x, R2 = 0.21, P = 0.002) and forest floor mass (y = 0.005 + 0.00005x, R2 = 0.22, P = 0.001). 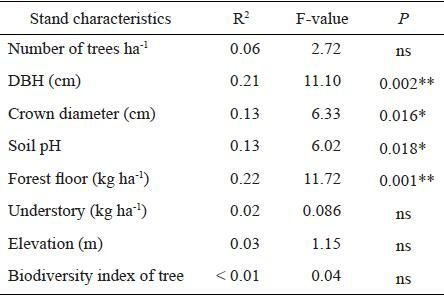 Effects of the other stand characteristics (understory, H', crown diameter and number of tree per hectare) on the number of specimens were not clear (table 2). The canonical discriminant analysis showed a grouping by stand type. Group means were significantly different (Wilks' Lambda = 0.005; F = 686.1; P < 0.001). The first canonical dimension accounted for most (97.8 %) of the variation (figure 4). The first five factors were DBH (R2 = 0.94, F240 = 295, P < 0.001), crown diameter (R2 = 0.74, F2 40 = 56.8, P < 0.001), forest floor mass (R2 = 0.67, F = 39.9, P < 0.001), number of Apodemus specimens (R2 = 0.15, F240 = 3.55, P = 0.038) and number of trees (R2 = 0.13, F2 40 = 3.11, P = 0.055). difference based on Tukey HSD (P > 0.05). que no hay diferencia significativa según Tukey (P > 0,05). the statistic tests: * = P < 0.05; ** = P < 0.01; ns = not significant. sel suelo, masa de mantilla, masa de sotobosque, elevación, índice de biodiversidad). Figure 4. Canonical discriminant analysis of stand types [("A" (0-8 cm), circle; "B"
NoT; number of tree per hectare and pH; soil pH). de árboles por hectárea; pH: pH del suelo). Apodemus spp. abundance, driven primarily by A. flavicollis, increased with forest age in coppice oak forests. In coppice woodland, A. sylvaticus appeared in clear-cut and young woodlands, whereas A. flavicollis occurred most often in mature and old woodlands (Capizzi and Luiselli 1996). Similar to our results, others have found that A. flavicollis are generally more common in Thrace and Anatolia (Yigit et al. 2002, Colak et al. 2007, Krystufek and Vohralik 2007), and in mature forests than other Apodemus spp. (Pupila and Bergmanis 2006). In general there is a change in community dominance from habitat generalists to forest specialists during succession (Pinotti et al. 2015). However, it is not a universal principle that small mammals increase in abundance in older successional forest stages (Kirkland Jr. 1977). Older oak forests, which resulted in higher numbers of Apodemus flavicollis, exhibited common characteristics of older stands including trees with larger average DBH, superior crown diameter, higher forest floor mass and lower tree density. In many deciduous forests, temporal and spatial abundance of mice is influenced by seed supply (Angelstam et al. 1987, Montgomery et al. 1991, Fernandez et al. 1996). Although acorn productivity varies by oak species, it generally increases by middle age (DBH 50-80 cm), then decreases slightly (Auchmoody et al. 1993, Johnson 1994). In this current study, the amount of acorns was not measured, but it is surmised that it was the lowest in young stands and the highest in mature stands as demonstrated by the positive relation to trees with larger DBH and superior crown diameter and lower tree density. Others have also found that Apodemus spp. are related to a high level of canopy cover (Marsh and Harris 2000). Apodemus spp. use burrows and tunnel systems to nest, store food and survive harsh seasons or conditions below ground (Jennings 1975). The high forest floor biomass helps perpetuate Apodemus spp. abundance. We conclude that the increased number of Apodemus spp. specimens, particularly A. flavicollis, with developing stage stands was most likely explained by increased forest floor mass and acorn abundance. Although silvicultural practices can negatively affect Apodemus spp. abundance (Rhim and Lee 2001), conversion of coppice oak forests to high forest appears generally beneficial for A. flavicollis. Ensuring the continued existence of Apodemus spp. contributes to overall biodiversity conservation. Abandonment of the coppice oak practices, in the Thrace, may positively affect the local abundance of Apodemus spp., particularly A. flavicollis. Our results suggest that common woodland management practices, such as maintaining low disturbance areas and encouraging a diverse range of native tree and shrub species will help ensure survival of A. flavicollis. Further research is necessary to determine impacts of various forest management practices on A. sylvaticus and A. agrarius. This work was supported by The Scientific and Technological Research Council of Turkey (TUBITAK), Project number: TOVAG-107O750. We thank the Istanbul Regional Forestry Directorate for their assistance and support in the field. Kirkland GL Jr. 1977. Responses of small mammals to the clear-cutting of Northern Appalachian forests. Journal of Mammalogy 58(4):600-609.